When adapting an Italian comic book that stars a moody Rupert Everett lookalike investigating crimes of the undead and aided by what is essentially Groucho Marx, the first thing you should do is…well…not do that. But, the makers of Dylan Dog: Dead of Night just couldn’t help themselves. No pulse, and that’s the problem. Truth be told, I can’t really blame them. Thanks to a little movie called Twilight, (and also to True Blood, et al.) vampires and werewolves and things that go bump are hot right now. And genre mash-ups are the catnip of the geek set. I made no bones about my love for Abraham Lincoln: Vampire Hunter. I’d like to see more movies like that on the big screen, but I don’t think it’s “mainstream” enough for folks yet. In the meantime, there was Dylan Dog. On the surface, this looks like everything I could want. Slamming “supernatural” together with “private eye” sounds like a blast. And it starts out promisingly enough as Dylan, played here by Superman Returns’ Brandon Routh, narrates in very noir-ish fashion how monsters are real and he is one of the few humans who knows about them. He lives in a crappy apartment, shuns most modern technology, and is actually “retired” from investigating the supernatural after the death of his girlfriend. Instead, we find him running more mundane detective cases like cheating wives and husbands. In fact, Dylan looking up the barrel of a gun and talking one of those cheating husbands down from shooting him and then even acquiring the man as a client is easily the most interesting scene in the movie. It is also, sadly, the first. From there, the film slides farther and farther away from quirky detective movie and into the realm of schlocky action flick. Dylan’s sidekick, Marcus, gets killed and zombie-fied early on, and he becomes the only real source of “comedy” on-hand. Comedy is in quotations there because — and I cannot stress this enough — you will not laugh. Otherwise, Dylan Dog moves forward with all the seriousness and stiffness of a Buckingham Palace Guard. And that might have even been fine if the production values were there to make Dylan look like the badass he was supposed to be. But a late “storming the palace” fight scene was little more than Routh walking menacingly toward the camera firing off whatever gun Marcus tossed his way. 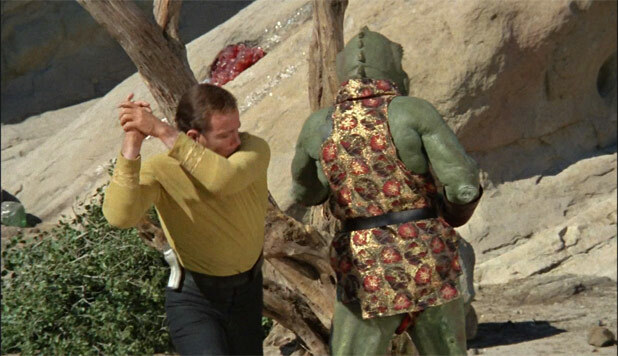 Later, a showdown with a demon had all the grace and dignity of the Captain Kirk vs. Gorn battle. This won all the Emmys. Worse, the movie relied all-too-0ften on the old “Bond Villain Mentality” of leaving the hero just enough rope to get free of the whirling death blades. In one case, a rampaging, mindless zombie actually uses a rope to send Marcus dangling precariously over another horde of starving zombies as he fights Dylan. But why a zombie wouldn’t just throw the guy over the railing to his death (re-death?) is anyone’s guess. Our heroes are also left alive inside a crypt by a pack of vampires that could easily, easily have killed them. In another movie with a different tone, this could have been played for laughs, but in this one, it’s just dumb. Finally, while Superman Returns had plenty of faults, chief among them was the acting of Brandon Routh. 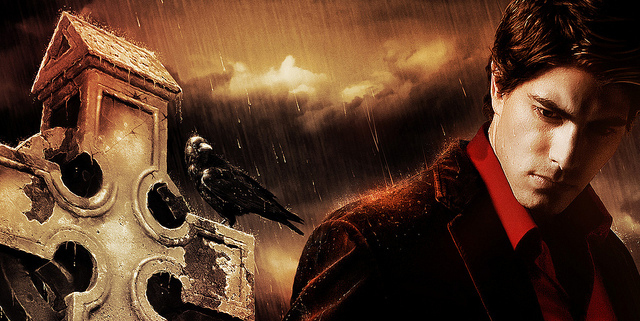 Even when playing the stoic loner character of Dylan Dog, Routh fails to bring any spark or nuance to his portrayal. He’s practically as lifeless as the undead he pursues. And I think he can actually do better. His recurring role in Chuck a few years back showed he has at least some range, and his appearance in Scott Pilgrim vs. The World demonstrated he has a sense of humor. But after Superman and Dog, it’s clear he’s just not leading man material. Wrapping up, Dylan Dog: Dead of Night isn’t a terrible movie. I don’t think it deserves the 5% Rotten rating it currently has on Rotten Tomatoes. It’s certainly watchable and at least mildly entertaining. But it is absolutely mediocre, and falls unforgivably short of its potential as a truly clever genre mash-up monster flick. One of the creatures on this poster is trying to poop. Guess which one! 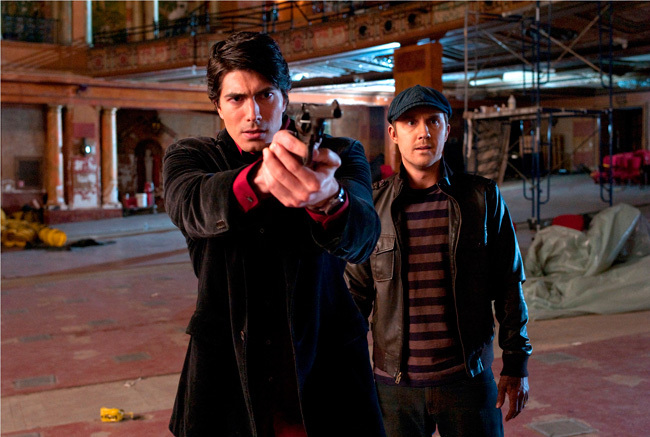 Tags: Brandon Routh, Dylan Dog, Dylan Dog: Dead of Night, movies, noir, review, vampires, werewolves. Bookmark the permalink. I remember being intrigued by this when it came out, and seeing it get roundly thrashed. I’m still moderately curious about it even so, but my expectations are low, low, low. I’d mostly be watching it out of an interest in seeing non-romantic urban fantasy in a movie. Still. If an urban fantasy detective story appeals to you, I think I’ve got a book series to recommend to you. Check out Jim Butcher’s Dresden Files (first one is Storm Front, there are about eleven now I think.) It’s this stuff done right. I just now figured out how to get the alt-tags to show up again in WP’s “new” thingy. Stoopid thingy. I actually watched Dresden Files on Sci-Fi a few years back, and liked it. I’ve heard that was a pretty pale version of the novels, of course. I’ll have to check them out someday. That was actually how I was introduced to it as well. It is inferior to the books (and makes some big changes, some of which are reasonable for TV). But the TV series was definitely fun itself.